Learn all about the prominent Glock pistol in this Glock book that covers everything from Glock models & magazines to accessories and upgrades. Glock Deconstructed is the ultimate guide for anyone wanting to gather knowledge about any topic related to the popular Glock pistol. 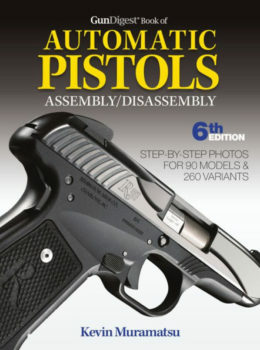 Not only does this Glock book cover the various models of the prominent firearm, but it also details the various accessories, magazines, and upgrades available for the weapon. You will also find an interesting exploration of the growing Glock aftermarket industry, as well as a review of Gen4 improvements. The information covered in this book is enhanced by over 300 detailed, high-resolution black and white photos. Patrick Sweeney is a retired American gunsmith and a well-known author in the gunsmithing field. He has authored many of Gun Digest Books’ most popular titles, and is the Handguns Editor of Guns & Ammo magazine. This complex look at a rather simple gun is revealing. Whether you own five different Glocks and are looking for your sixth, or loathe them and wonder what all the fuss is about and if there’s enough to all the hoopla to change your mind, this book is sure to answer those questions and more. Best of all, it’s entertaining.